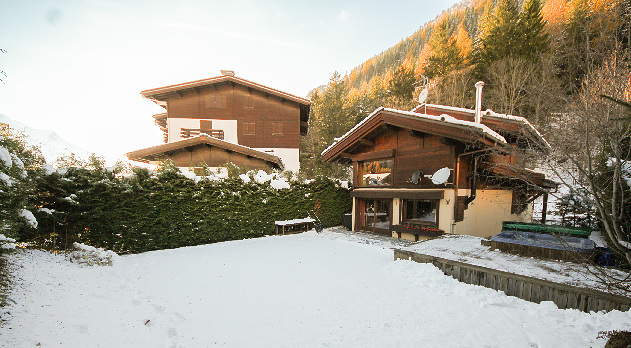 A beautiful, family-orientated ski chalet with a private garden and jacuzzi just a short walk from Grand Montets ski lift. This chalet has four bedrooms sleeping up to nine guests with a further two sofa beds on a mezzanine to accommodate 11 guests in total. 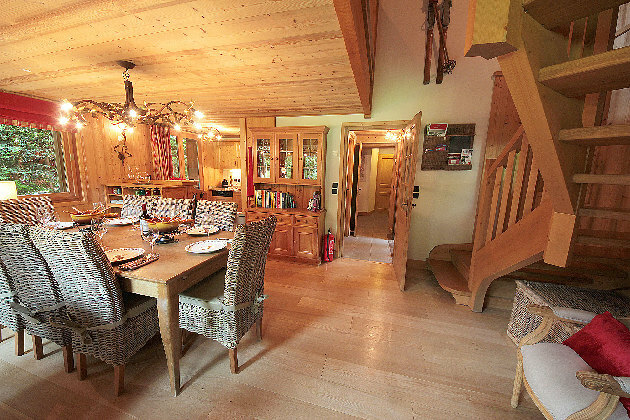 The chalet uses traditional alpine furnishings with a modern and luxurious feel to deliver a high grade holiday experience that is suited to one or two families looking for a 4-Star ski chalet at affordable prices. 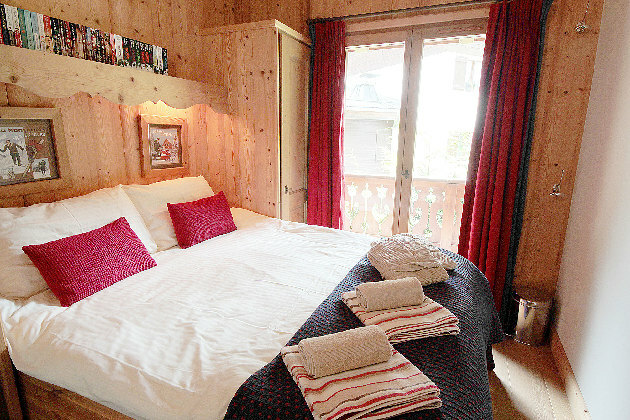 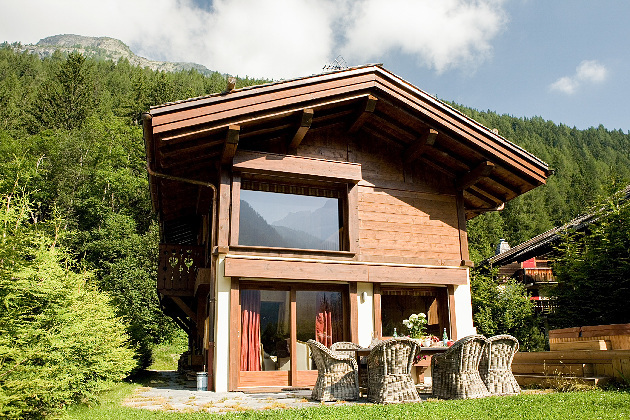 The chalet is tastefully decorated with alpine style furnishings and is both spacious and comfortable. 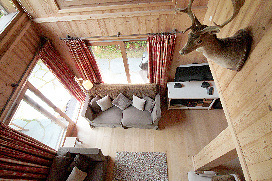 The open-plan living area allows guests to socialise, cook and relax without feeling crowded. 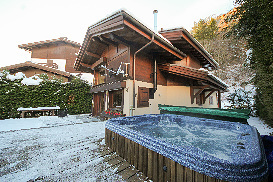 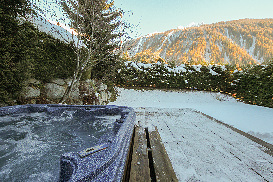 Outside the private garden with its large jacuzzi is a welcome respite after a day on the pistes or trails of Chamonix. 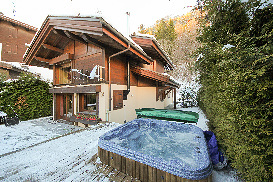 It's a short walk into the village or to the ski lifts so a car is not necessary even in winter. 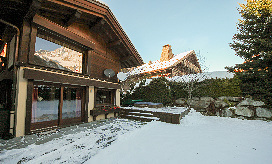 If you want to bring cars then there is parking for up to three vehicles at a time. The chalet makes use of its converted garage area to increase the interior space, although once inside the transition between the main chalet and the converted garage is unnoticeable. 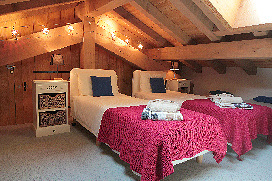 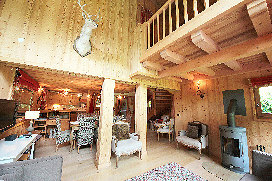 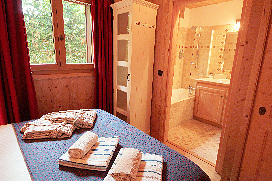 Click for Prices and Availability for Chalet Aiguille now. 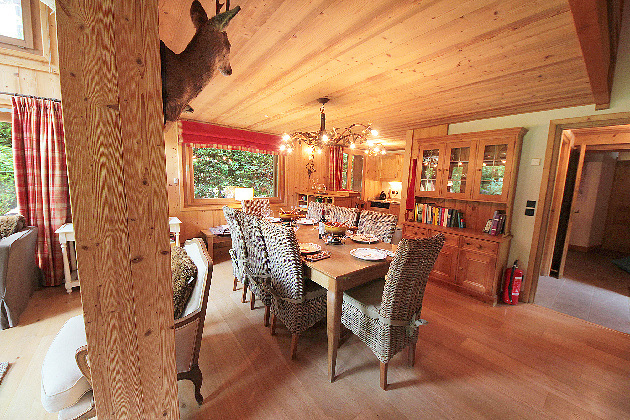 Tastefully decorated in an Alpine style, the chalet has an open-plan living area with a glass-fronted wood burning stove (firewood supplied). 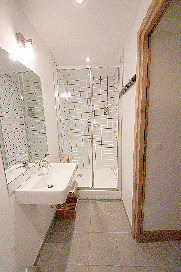 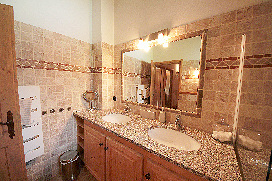 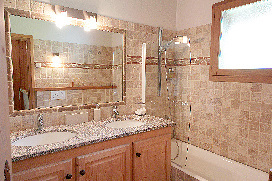 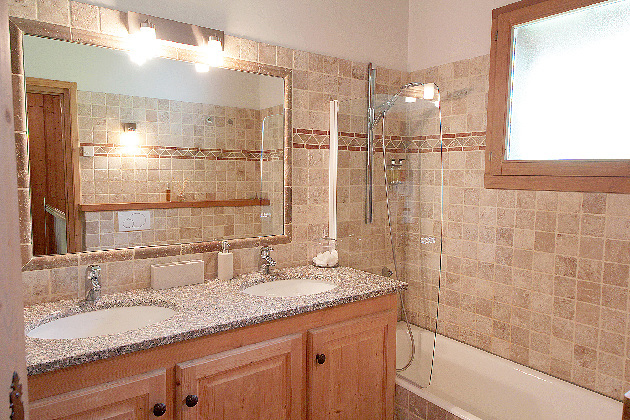 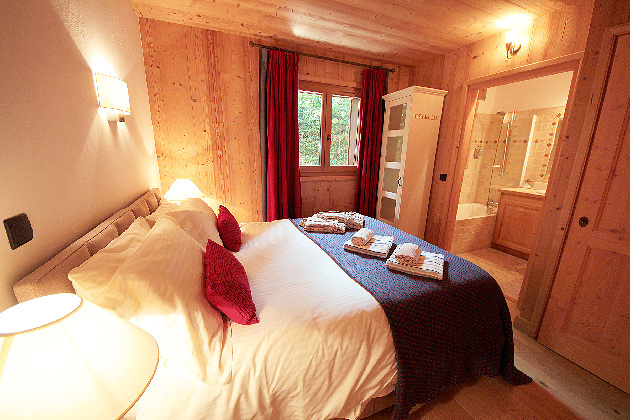 The chalet has two full bathrooms (one ensuite in Bedroom 1) plus a full shower room and a guest cloakroom. 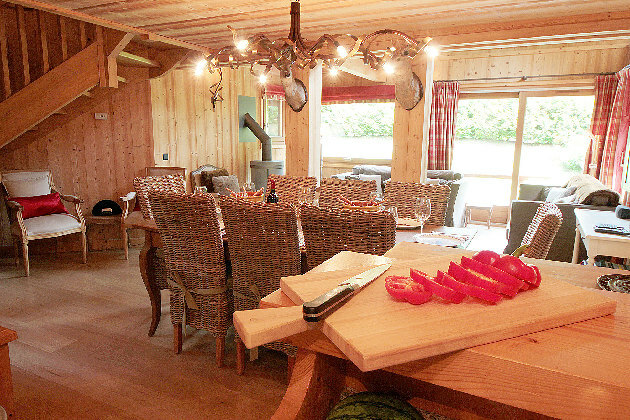 The kitchen is well-equipped with a full-size fridge/freezer, microwave and dishwasher, and there is also a laundry room with a washing machine and separate tumble dryer. 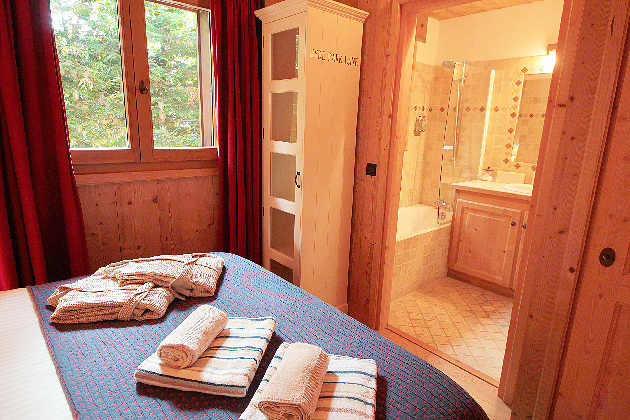 There is a ski boot dryer in the hallway with ski storage. 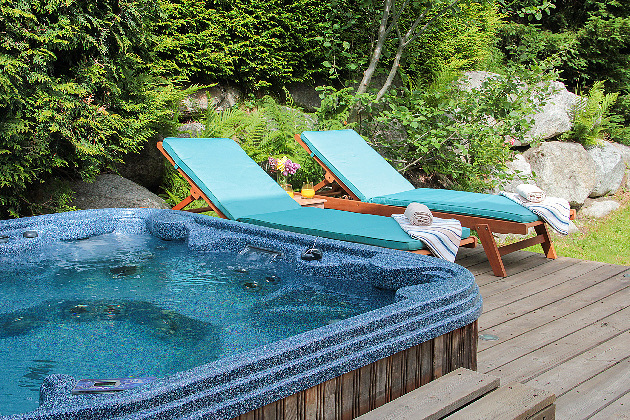 In the garden, the eight-person jacuzzi has lovely mountain views, a gas barbecue, sun loungers and teak garden furniture with cushions and a sun parasol. We ( 6 adults, 5 kids from 3-9 yrs old) had 3 relaxed days to celebrate new year at this well equipped chalet with good functioning jacuzzi. 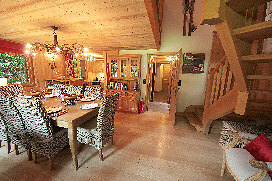 Kitchen is small but very well equipped to cook for large group of guests. 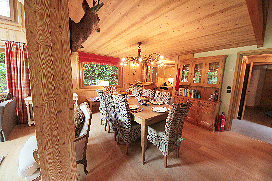 Living room and dining area together maybe slightly smaller than the photos suggested, but enough space for everyone. Host is very responsive and flexible if you need something extra ( eg two small matrasses were made available so all kids could sleep in bedrooms, and a small kids eating/ playing table was made available) In winter with snow only 2 cars can be parked at the house as else the snowplough cannot pass, but at 5 min walk at the school an extra car can be parked. 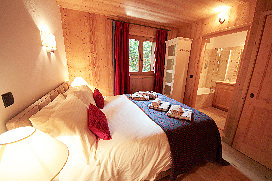 At 5-10 min walking distance ( in direction to centre of argentiere) you reach the gondel ( or kids ski teaching area,that can only be used with your kids having lessons there)... 4 -8 min walk in direction chamonix there are two easy skilifts and two beginners/ blue skipiste, a sledge area and a cross country piste. 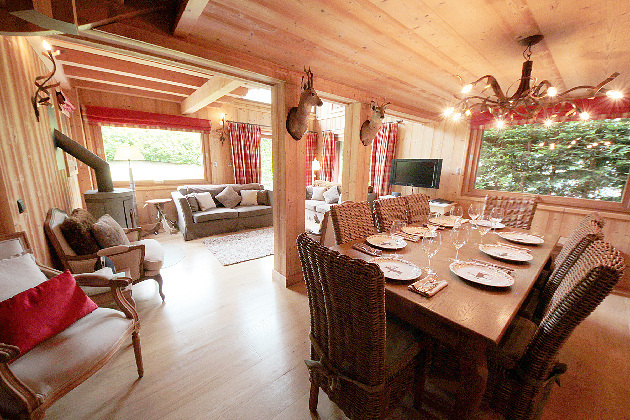 The place is absolutely fantastic! Beautiful surroundings, with loads to do, and the locals are great as well. 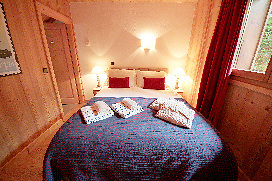 The accommodation was actually the highlight of our trip. The pictures do not do this place justice. Highly recommend it to anyone the loves hiking and climbing. 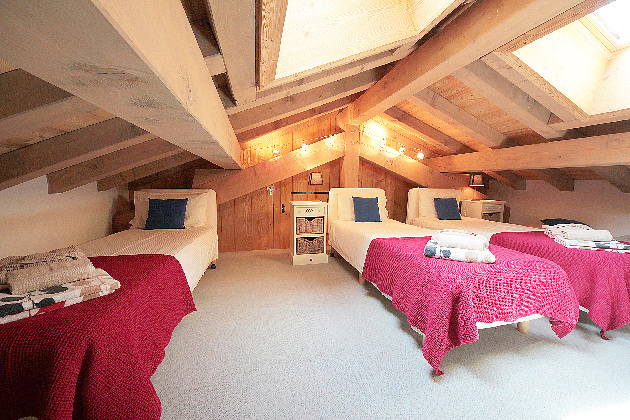 Wasn't ski season when I went but I'm pretty sure it would be good for them as well. 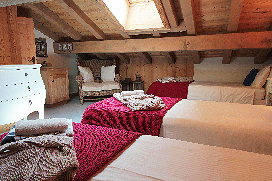 We have a family of five plus a caretaker. 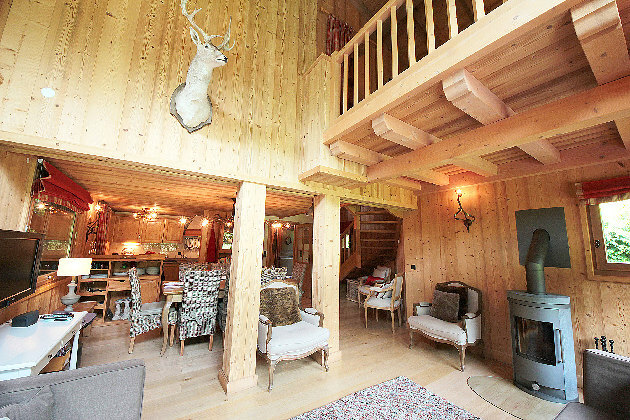 The Chalet was fantastic, the only one concern was the internet as it is via satellite, but on a ski vacation this was probably a blessing in disguise. The location turned out to be perfect for us, with a car, as our kids were in ski school at Grand Montet and we could get them door in less than 10 minutes. 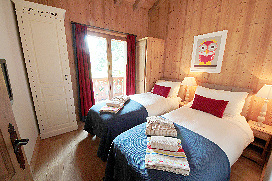 Plus with a very large and convenient parking lot, we could then jump on the Bus at Grand Montet and get to any of the other lifts in Chamonix easily. This was one of the best ski vacations we have had with a hot tub for the end of the day to top it off. 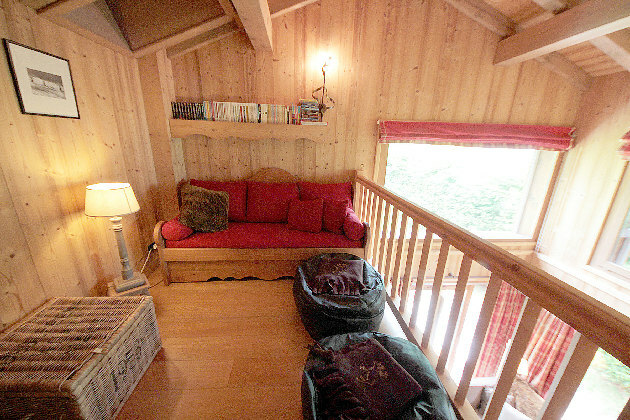 Le chalet est très confortable. Nous étions 7 adultes et et deux adolescents, nous avons tous profité confortablement de cet hébergement. 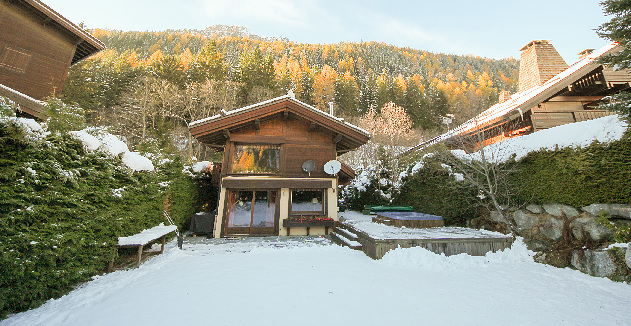 Le seul petit défaut que nous avons pu relever, c'est que les personnes sur place, maitrise mal le français et nous maitrisons très l'anglais. Nous avons quand même réussi à nous comprendre tant bien que mal.